As Woz mentioned in the previous post we have been busy but eating plenty of Vegan treats. 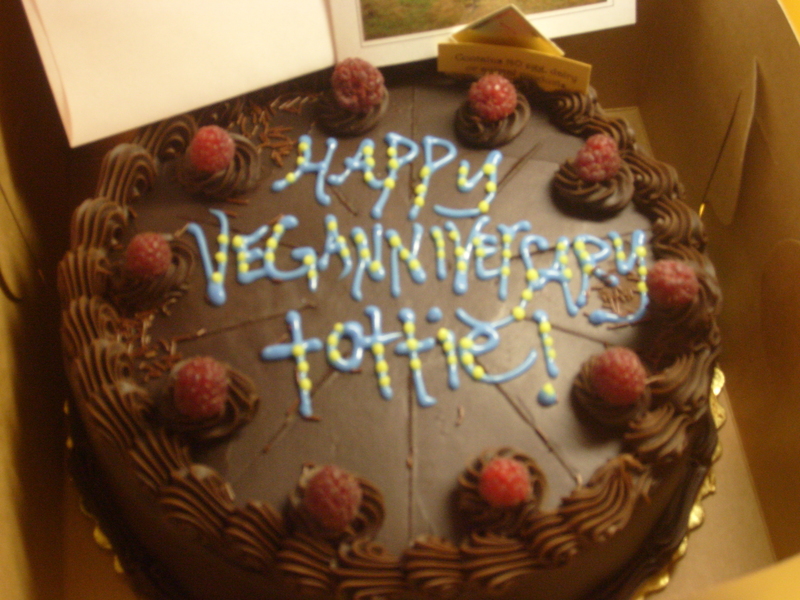 One of the main things that happened recently was my three year Veganniversary (October 10), and it was the best one yet!!! We started the morning off at Wandering Goat. 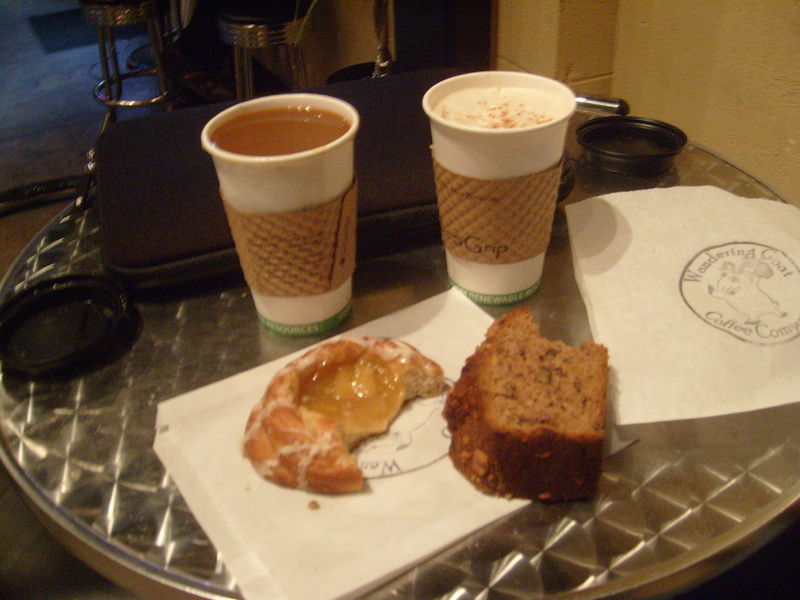 I got an apple Danish and the special coffee of the day (Guatemalan), and Woz went for the pumpkin bread (she loves her some pumpkin) and a soy Chai. Obviously we made sure to trade some sips and bites, as is the case most times when we go for different options. I had classes to attend so Woz dropped me off at LCC. (I will skip the boring class part and get right to the food!) The cafeteria area of LCC is VAIR Vegan friendly. They have basic things like fruit, fruits bowls, salads, juices, chips, fries, tots, baked potatoes, etc. but it doesn’t end there. Every day there is a Pan Asian area and they offer tempeh along with a choice of white or brown rice or noodles with mixed vegetables. They also have various energy/protein bars that are Vegan. The best part is the area that they call the Vegeteria because the menu changes daily and there is always some delicious Vegan option. 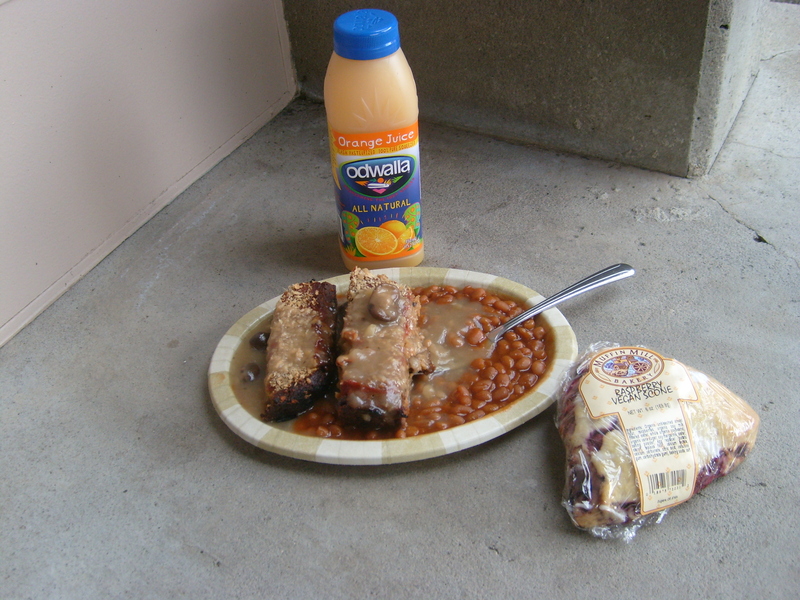 That day happened to be tempeh loaf with shitaki gravy and baked beans. I grabbed an Odwalla OJ to go along with it. It doesn’t end there though my friends, oh no. I forgot to mention that in the cafeteria there is also Blenders Cafe. They serve hot, cold, and frosted/blended tea and coffee (from Wandering Goat) as well as smoothies. They even sell Vegan sushi. The best part, however, is the fact they sell Divine Cupcakes, Holy Donuts!, and Muffin Mill Vegan cookies and scones. I went for the raspberry scone. Mmmm mmmm delicious. Later in the day Woz came home from work and had the tastiest sooprise in the world. She got me a cake from Sweet Life. It was not just an ordinary cake because Woz made sure to tell them to make it as chocolaty as possible (I may have an addiction, but that is for another post)! It was a little funny though because usually they put chocolate chunks on top of the cake but as you can see in the picture they put raspberries. Apparently I had enough and they were cutting me off? Sadly this was too much cake for us to completely finish especially because Woz Day was only 10 days later and that of course called for another dessert :). After dessert we decided to go ahead and get something to eat for dinner. My choice was Pizza Research Institute (PRI) much to Woz’s surprise because I ranked 4 other places above them in the overall category and 7 other places over them in the best option category in this post. Not to mention there are multiple places we still haven’t tried. 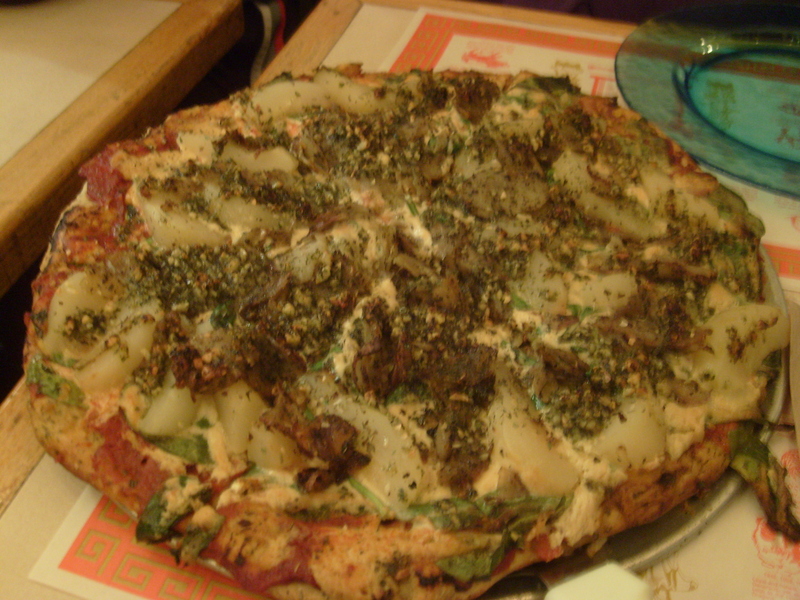 At PRI we ordered The 3P (potatoes, pesto, and pears). It sounds odd and even like it might not taste very good, but it is one of the BEST pizzas I have ever had the pleasure of tasting. Besides the 3Ps it has a tasty and crunchy crust, red sauce, white “cheese” sauce, and spinach. 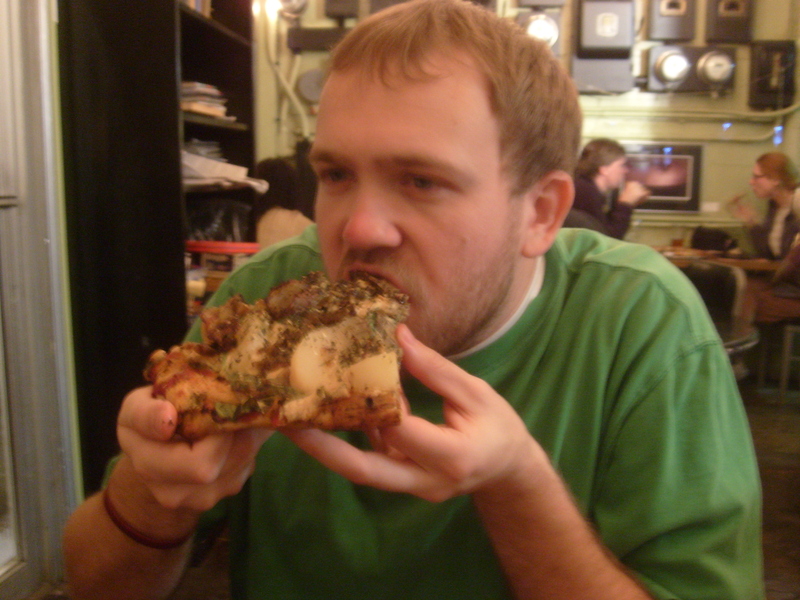 As you can see I enjoyed the pizza. I should also add that The 3P is good reheated or even cold. We ate our cold leftovers the next day on our way to the coast. 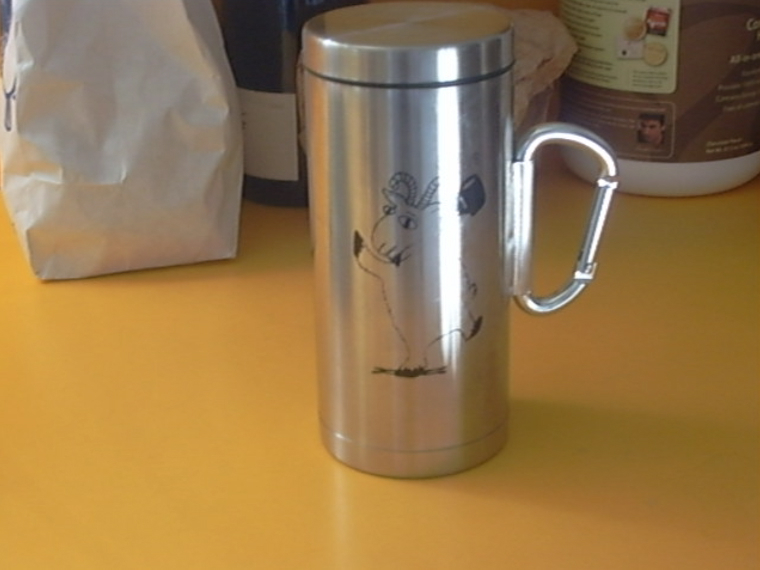 Wandering Goat has some nice travel mugs with their logo on them and I had been eyeing them for a while. Woz was going to get me one to give me on my Veganniversary but their supply ran out and the new batch didn’t come in when it was due. So a few days after my Veganniversary Woz gave me one last giftie. We ended the day by going to our friends’ house for a game night/going away party for one of our other friends. It was one of the best days I have ever had and definitely the best Veganniversary I have had and it is all thanks to my Sweetie and Fioshayy Wozzie :). what a nice way to celebrate! one of the things i love most about being vegan is my renewed relationship with food. i want GOOD things that taste YUMMY. in my pregan days i can’t tell you how many times a week i’d hit the drive thru and never savor anything i ate. don’t get me wrong, i still have my quickie eat moments, but few and far between. yay for great friends and awesome food. happy vegan birthday!